Having to spend half of every month working in London throughout last season was frustrating on many levels – not least, when I knew the bass fishing conditions were ideal, yet I was unable to guide clients or fish myself. Furthermore, there were many successful sessions in 2017 that I simply didn’t have the time to write about. Therefore, I thought I’d take the opportunity to write a quick summary of events. I’ve tried to mention as many of the learning points as possible – including the lures used and the tides, sea and weather conditions experienced at the time. Ron took little convincing to head out onto the shingle on a drizzly evening back in late June. He’d noted the catches my clients and I had achieved on the needlefish in darkness and fancied a go himself. There was a slight swell running up the beach that night and because there was drizzle in the air, it was obviously cloudy and completely with no ambient light to speak of. With a neap high tide peaking at 2304, the plan was for him to fish over a very shallow patch of reef two hours either side of high water. Due to their design, the Jim’s Lures needlefish remained very stable in the water and could easily be cast 40 – 50m into the breeze on one of my ‘client’ Savage Gear Salt CCS 7-28g rods he was using (see my review here). Around 20 minutes into the ebb, the bass moved in – resulting in two around the 3.5 – 4lb mark. Both fish nailed the lure where the reef met the shingle only a couple of metres from his stance. He loved it and so did I!! Well done Ron! That walk through the overgrown thorn bushes (to get to the mark) was worth it! The colours on a bass are wonderfully accentuated in the camera flash – such a attractive fish. A distinguished photographer who subsequently gave me lots of tips, Paul was the first of a number of clients who booked me for two sessions over consecutive days. He’d driven all the way down from the Wirral and was staying overnight at a lovely B&B, in a beautiful south Devon hamlet called Galmpton. A very proficient angler, Paul very much enjoyed his fly fishing, which as I explained has many similarities to lure fishing for bass. The first 4 hour session was completed on a westerly facing stretch of coastline on a flooding spring tide. Some days everything looks and feels great, but the fish just don’t turn up and unfortunately for Paul, this was one of them! We made plans to meet up on a completely different part of the coast at low water the next day. A long walk ensued, but it was time well spent as it enabled me to point out a number of bass holding and patrolling points which I believed he found extremely useful. He fished a number of marks from the mid afternoon onwards, but it wasn’t until the evening, whilst casting into a tiny inlet, crammed with surface feeding mullet, that the action took off. A small bass initially, and then a bigger one took his line around a large rock snapping the braid instantly… A real shame. However, he later got his just deserts when, an hour into darkness, whilst fishing with one of my tiny Maria Squash F95 lures here he latched into this lovely bass below. Nudging 2lb, it was no monster but it proved to Paul that bass could easily pick up on the wriggling, rattling lure in the gloom. A photograph that perfectly encapsulates what bass fishing in darkness is all about. I can completely appreciate, that until you catch that first bass in darkness on a lure, you’re constantly thinking… does this really work? If there was a prize for being the best student (client) I think Josh would win it! Having recently purchased a lovely rod and reel combination, in addition to a selection of proven lures, he was ready for action. On a blisteringly hot day, my plan was for him to fish four hours in daylight, and four in darkness – something he hadn’t really considered before. With bait fish getting smashed all over the coastline, we headed out to an inviting headland that juts out into a some fast running water. 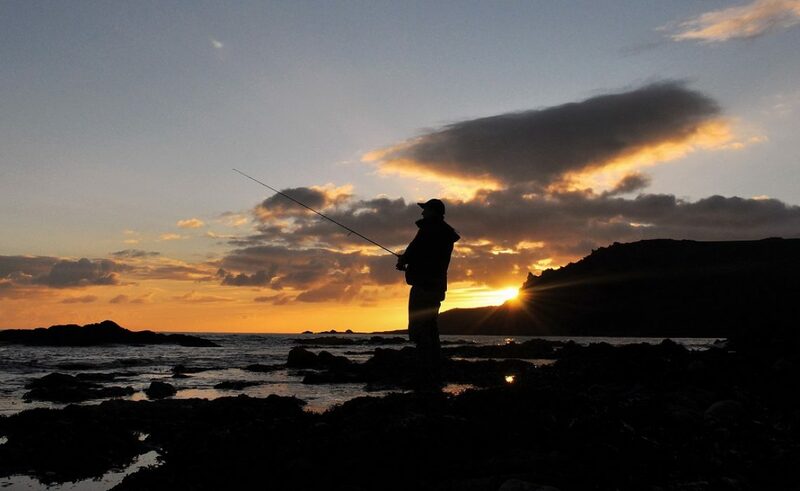 Indeed, the current here, on a big tide like we had during this session boils and swirls as it moves past – the ideal place to attempt to catch a bass when it is very bright and flat calm. Noting the bait fish, I attached a small subtle surface lure, namely the Bear King Slim Skimmer here as it had been catching lots of bass around the time. There were garfish about in numbers and I was concerned a bass wouldn’t get near it, but eventually Josh’s lure was hit hard by something out in the flow. Not a huge bass admittedly, but this one was one of the most deserved of the season – see you again in the spring mate. My ‘star pupil’ Josh with his aggressive looking bass. It’s no wonder they scare the life out of fry, sandeels, blennies, shrimps, crabs and mackerel! I massively enjoyed guiding Brothers Roger and Nigel. Nigel had treated his older brother to a couple of days of guided fishing. They were fantastic company over the two four-hour sessions – the first of which was conducted in darkness. Both received bites that night (probably small pollack or bass) on the senkos, but with the wind forecast to increase early the next day, we headed to a mark offering some shelter and safety. Under a clear blue sky, Roger managed the bass below on a Ryobi Trapper minnow diving lure here that he was casting into the surf from a beach. Following this, once the tide had ebbed we were able to fish from a nearby rock platform. A nice little bass caught a sunny day! Nigel was briefed to keep casting between a couple of underwater rocks, alternating between a Savage Gear Sandeel and an IMA Hound Glide. Whilst Roger bounced a small paddletail lure (a DAM Kick S Minnow here) through the sandy gullies situated on the left side of the ‘island’. Again, there were lots of bait fish present in the shallows, and the lure he was using was almost identical to them (match the hatch). “There! I said” Pointing right below us in a sheltered gully offering relativel clear water was a large mahogany shaped fish was prowling beneath the fry. But I couldn’t quite make out if it was a wrasse or a pollack – either way, it was big! I instructed Roger to cast the lure 10 yards up the sandy gully which he duly did “I think I’m snagged Marc” But the sound of the drag being ripped from the spool suggested otherwise! With Roger struggling to keep his balance, I assisted him whilst grabbing the rod – whatever was on the end had a serious amount of power! I quickly handed Roger the Savage Gear rod but by now the line was perilously close to a very jagged outcrop and ‘PING’ it was gone – gutted! The saving grace however, was 10 minutes later Roger (who was by now an expert at working this great little lure) managed to pull the rather nice wrasse (below) out of a nearby gully as the tide quickly dropped. I’m really looking forward to guiding them again this season and hopefully Nigel will get in on the action as well. Next up, I had the pleasure of guiding three enthusiasts and fellow members of the Bass Angler’s Sportfishing Society – Glenn, Steve and Nick. They’d all been staying in the area for a few days as part of their annual pilgrimage to south Devon, but the calm settled conditions they’d encountered had hampered their catch rate. Because of this I suggested a 0230 start in, of course, darkness. Expecting a reply saying ‘Please could we start a little later Marc?’ I was pleasantly surprised to read ‘Yes, we are up for an early morning session’. 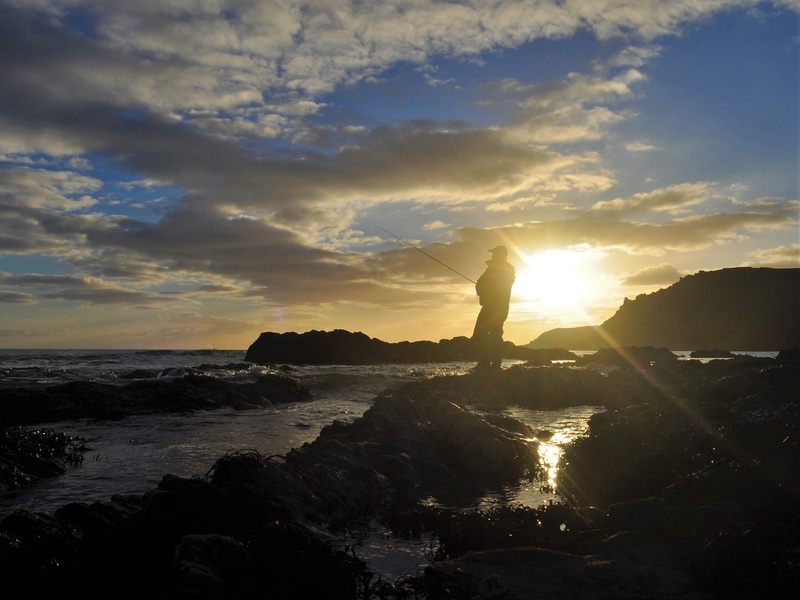 I knew this would give them an excellent chance to fish a productive reef in the dark, followed by an exploration of the nearby coves as dawn broke and the tide ebbed. At precisely 0430 about an hour before high water, I was stood chatting to Nick as the water lapped our wading boots when his rod walloped over! A good bass had taken his Albie Snax lure literally a few metres from his feet. Switching on the headlight, we both enjoyed the spectacle of seeing the fish powering through the shallows before a team effort saw the 4.5lb beauty reach the shingle. Steve managed a small bass (another one dropped off his hook as he was about to lift it from the sea) just as first light appeared, but it was Glenn who I felt for. His friends were very happy with their success therefore, I decided to concentrate on him for the final hour or so of the session as the sun beagn to beat down upon us. I knew just the spot for Glenn and proceeded to ask him to attach one of his Xorus Frosty surface lures. Adjacent to a very rarely fished cove, was a group of rocks where a patch of flat reef sits around 6ft beneath the surface, between two mini islands. I’ve previously caught some nice bass here, with the ebb being particularly productive as the bass just seem to sit and wait at the entrance to a gully that’s runs parallel to your stance. As so often happens – first cast, and there was an almighty swirl as something big investigated the brilliantly worked lure. Did it take it? Well Glenn’s splendid Daiwa Branzino rod reacted quicker than both of us (it had been a long session!) and before either of us knew what was happening the (very decent) bass was taking serious line against the drag and was heading straight for one of the islands… Quite suddenly, after only having the fish on for 7 or 8 seconds the lure flew out of the water as the hooks had pulled – definitely a case of the (big) one that got away! Apologies, as I know I used this image in my last blog post. This was a bass we wanted to return quickly so I’ve only this one photograph of it. What a cracker though! Glenn, Nick and Steve. Great company, and great ‘sports’ for allowing me to drag them out bass fishing from 0230 – 1030. The icing on the cake would have been landing Glenn’s bass under that brilliant blue sky… Now that would have been some photograph! I just love meeting nice people and Mark and Paul (my clients during a fabulous day in late September) were among the nicest (can I say that!?). They were just so enthusiastic, willing to listen and to learn, that I was willing them to catch one so, so much. This split session encompassing four hours in daylight/four hours in darkness was an ‘eye opening’ (their words) as they were able to search around the rocks and narrow gullies, (at low water) that we would be returning to fish that night. During that first session though, Mark managed a small bass that took the IMA Hound Glide here right on the dividing line between some clear and dirtier water – in my experience a very good place to work a lure. Later that night, we ventured out full of excitement and dare I say it, expectancy. The tide was a relatively small neap (4.5m Salcombe scale) with a high tide around 2222. It was another one of those occasions when either the Moon appearing or disappearing, in conjunction with the tide turning switched the bass on. One bass was landed but they both managed some good hits on the white senkos with Mark’s fish (below) grabbing a pearl Albie Snax almost beneath the rod tip! Mark spends much of the summer working in south Devon therefore, we plan to meet up again later this year for ‘Part 2’ – Can’t wait. It is immensely satisfying for both client and guide when a plan works. To think, a few hours earlier Mark and Paul were stood exactly where this bass took the lure. I rate the OSP Dolive Stick here very highly. They cast well, look fantastic in the water on a variety of retrieve styles and they catch bass, no doubt about it. Admittedly, I’ve never caught one over 3lb on one. I’m aware of lots of people who swear by them for numbers the size of bass though – just ask Henry Gilbey and his fishing companion Mark Quinton. I haven’t fished with a DoLive at night (yet) but I have to say that when I’m using them during the day, I can’t help but think a wrasse is going to beat a bass to it! I’ve caught quite a few 4lb+ wrasse on them, and when they crunch the lure you often think, in those first couple of seconds of the battle, that you’ve hooked a decent bass! Second cast from the shingle, into the left hand side of the cove and at a range of 5 metres the rod pulled over fiercely – Yes! I was utterly convinced this was a bass, but when after 10 seconds of the battle you don’t see that boil and splash on the surface you’re starting to think either very big bass, or decent wrasse… It was the later, but what a fabulous fish all the same. As much as I love everything about bass, I’ll never tire of catching big wrasse from the shore – as the are a very sporting species when hooked in shallow water especially. A big wrasse caught in less than 18″ of water that completely destroyed the OSP DoLive Stick! My plan for the 2018 season is to write shorter ‘Client Catches’ and ‘My Catches’ articles. However, they will be within a week of the actual sessions and will always encompass the weather, tides, lures and any other pertinent points that I hope you find helpful. By writing shorter posts, it will allow me to write more often, so that my readers have a more recent snapshot of events. My Twitter Instagram and Facebook pages will also be regularly updated with the catches my clients and I achieve. Now that I am guiding ‘full time’ it will allow me more rime to keep everything ‘up to date’ whilst also enabling me to highlight potential ‘opportune times’ in the days ahead if, of course, I am not already booked! Finally, I hope to release details of my forthcoming ‘guiding and accommodation package deals‘ (with set dates) late next week. Previous The Albie Snax – The most effective ‘all round’ lure out there?